Cutting firewood with a chain saw can be an exhilarating, manly kind of outdoorsy exercise. It involves cutting the fallen tree to a desired sized log in a process call bucking. Bucking can be done using a log for support, using a support stand or even without support. 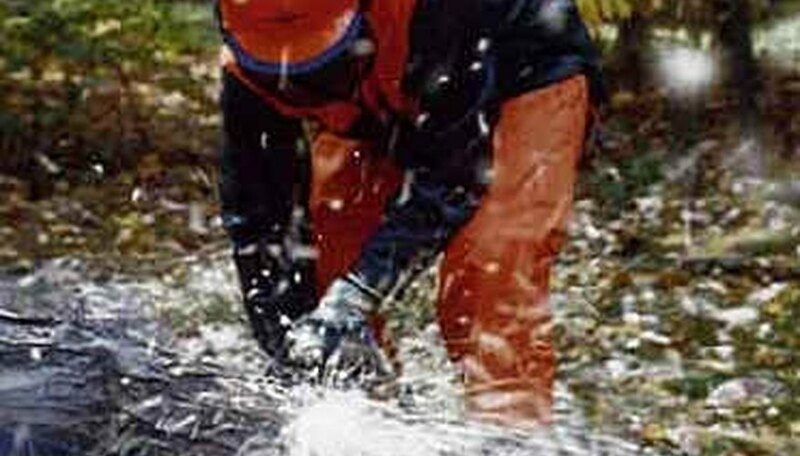 With or without support bucking requires total concentration and attention to detail in order to operate the chain saw efficiently and safely. Put on all appropriate safety gear including ear protection, safety shoes, gloves, safety glasses and hard hat. Clear the area where you will be cutting of all extraneous debris. Determine whether you will be using support or bucking without support. If you are bucking with support proceed to Step 4. If you are bucking without support proceed to Step 3. Start the chain saw. Over-cut the log on the top side of the fallen tree. Keep the bottom of the chain saw against the log and exert a slight downward pressure. Cut 1/3 of the way through the log. Roll the log over. Finish over-cutting the log by cutting through the remaining 2/3 and meeting the original cut. Determine the compression side of the log. Start the chain saw. Make your first cut 1/3 of the way through the log on the compression side. Finish cutting through the remaining 2/3 of the log on the opposite side of the log. Only cut through one log at a time. If the saw blade becomes pinched immediately turn the saw off. Drive a wedge into the cut until you can easily remove the blade of the chain saw. Do not attempt to start a chain saw while the blade is pinched in a log. Use extreme caution when dealing with partially fallen trees. Poor support makes the direction of fall unpredictable and can cause severe injury. Consider using a cable winch or block and tackle to pull the tree down completely before using a chain saw to cut it. Never stand on the log you are cutting. Never stand downhill from a log you are cutting. Never turn the chain saw upside down to cut. The saw cannot be controlled in this position. Do not cut logs in a cluttered or tangled area.